Does it justify its premium price tag? The A9F’s most outstanding feature is, of course, its 4K UHD (3840 x 2160) OLED panel. There’s nothing in the LED-backlit LCD universe that can match the blacks and overall rich image of OLED, though there are those who prefer the brightness that can enable a good LED TV to make high dynamic range (HDR) material really pop. The integrated kickstand makes it a breeze to set up the A9F on piece of furniture, but it folds in tight for wall mounting. 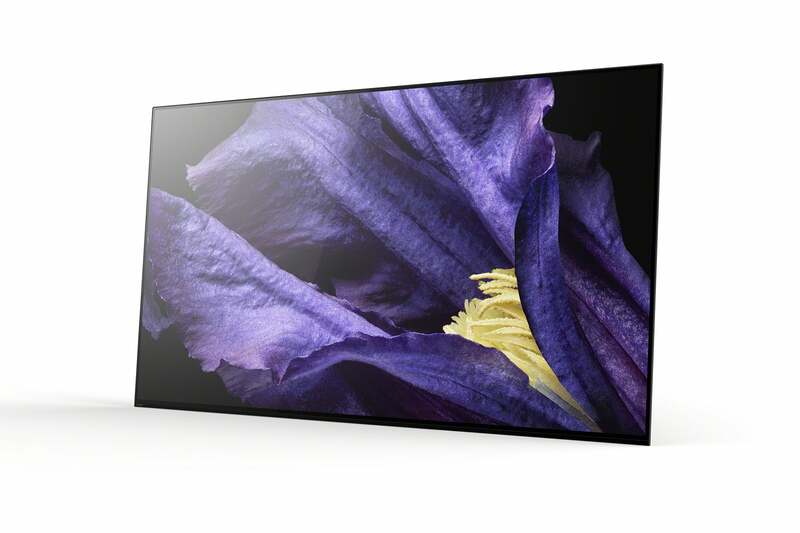 Despite its extremely thin profile, the A9F delivers amazing sound for a flat-panel TV. Like its forerunners, the A1E and A8F, the A9F benefits from a clever design that includes a built-in kickstand to house all its I/O ports and electronics. 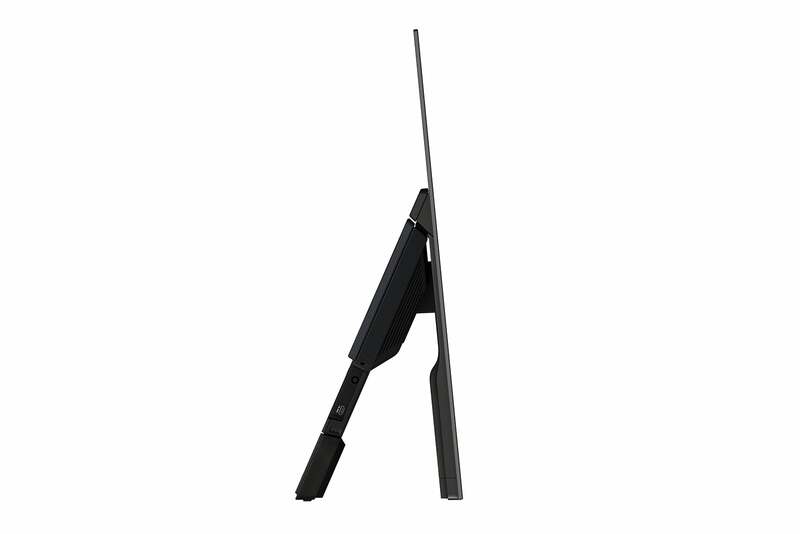 A detachable counterweight is provided that can be affixed to the bottom of the kickstand (the thicker part in the image above), to keep the TV stable on a stand. Without it, the TV remains light enough for wall-mounting. Sony’s A9F OLED TV has all the modern connectors. The A9F’s port selection is what you’d expect from a modern TV: four HDMI 2.0 ports, with one facing to the side for quick hook-ups. 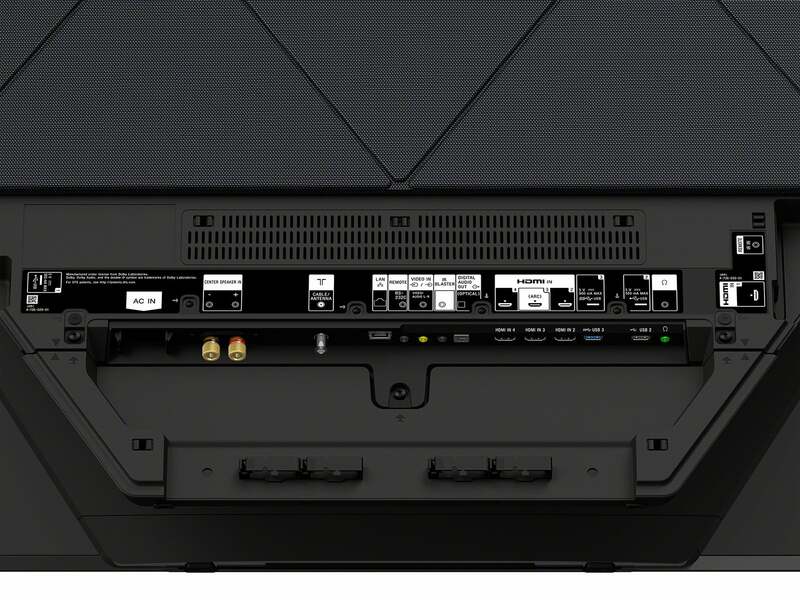 There’s also coax for antennas or set-top boxes, as well as two USB ports on the back and one on the side. A single 3.5mm jack will accept composite/stereo audio via an adapter cable (not included), and there are also IR blaster and RS-232C ports. Audio output is via both eARC (more on that in a bit) and optical S/PDIF. There’s a 3.5mm stereo headphone output as well. The users’ guide doesn’t say whether this can double as a line-level output. If you try that, start with the volume control all the way down and increase it very slowly. Internet connectivity is provided by way of ethernet and 802.11ac Wi-Fi. There’s also support for Bluetooth 4.2. Alas, while I rate Sony TVs as some of the best in the business, that’s because of their high-quality physical design and picture—not because of the interface and remote. The Android TV interface is constantly improving and certainly is better than it was two years ago, but it still lags a bit in efficiency and Sony’s action menus require more clicks than I consider ideal. But Android doesn’t crash anymore, and for the very first time—the video app actually enumerated all the test files on my USB stick without an issue. Part of the problem is on Sony for leaving the home screen so busy—I much prefer Hisense’s cleaner Android TV implementation. But many users will be more than willing to live with any navigational shortcomings simply because of Android’s veritable ocean of apps, many of which are excellent. One more Android TV iteration (it’s currently on 8.x) and I’ll probably stop complaining altogether. The A9F’s remote isn’t bad, it’s just not great or particularly attractive. I like the dedicated transport controls, but the control rocker and ring of function buttons are too small. It simply seems a bit old-school for a $4,500 OLED TV. 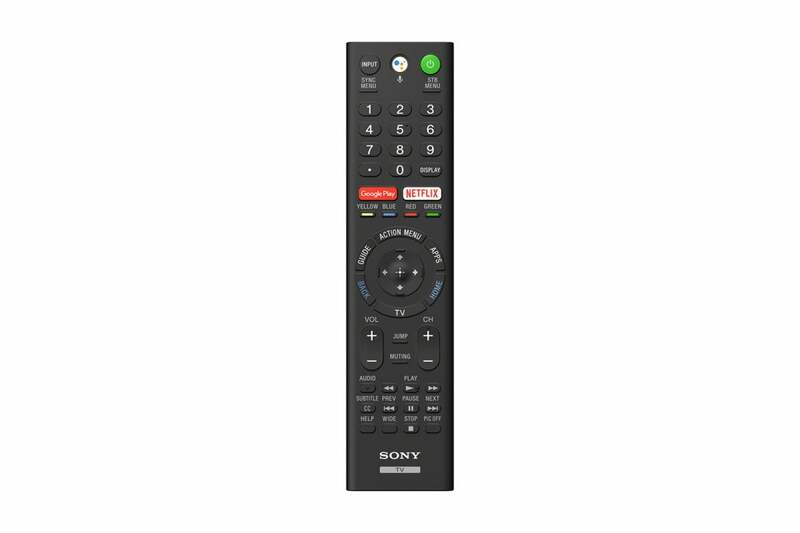 The real issue for me is Sony’s remote control: Mostly because of the ring of only-somewhat-related functions around the too-small cursor controls. I also dislike the Netflix and Google Play advertising buttons dead center, where they draw the eye. There’s also nothing ergonomic about the profile, which is a fancy way of saying it’s not all that comfortable to hold. The redeeming features are that it’s universal, and there’s a dedicated transport control section at the bottom. While Sony’s system is workable, Samsung, Roku, and especially LG with its Magic Remote and free-moving cursor all offer better overall ease of use. The big exception to that rant is the channel/programming guide, which is absolutely top notch. All too many vendors don’t provide that handy tool. Starting with the bottom line—the A9F is an excellent TV and the picture is fantastic: color and brightness (about 780 nits in the peak areas of HDR) are excellent, as are blacks. The viewing angles are very wide, there are no lighting artifacts, and screen uniformity is nigh on perfect. This is OLED we’re talking about; however, it’s perhaps not the best OLED TV. Based on the outstanding processing found in the company’s LED-backlit LCD TVs, and the price of the A9F, I was fully expecting it to achieve the picture perfection that narrowly escapes the LG E8-series. After all, both manufacturers are essentially using the same panel. Sony comes relatively close, but it’s no cigar. Apparently what works with backlit-LED LCD doesn’t necessarily work with OLED. In most ways, Sony’s A9F is the equal of LG’s E8. To our surprise, however, Sony’s video processing with highly detailed pans and motion isn’t quite a match for the LG’s. Specifically, the processing of detailed areas in motion, such as a cityscape being panned or a forest with moving leaves suffered from more moiré and shimmer than I saw on the LG E8, which exhibits almost none. I could eliminate judder (jumpy/shuddery pans) by upping the motion smoothness to max, and the moiré was minimized by setting the video noise setting to high, but it never matched what I was able to attain with the E8. And I spent a lot more time trying various combinations of settings with the A9F than the E8. These issues are surprising, because Sony touts its new X1 Ultimate processor and Pixel Contrast Booster. The contrast booster did seem to work, but it exacerbated the issues I’ve already mentioned. The algorithms being employed may be improved over time and delivered to the TV in an update, but still, “ultimate” doesn’t leave a lot of headroom, linguistically speaking. What’s next, “Extreme Ultimate”? The A9F supports HDR10, Dolby Vision, and HLG HDR, and it delivers them all to good effect. Sony also offers a Netflix-calibrated mode, which is touted to show Netflix content as it was intended to be seen. I rarely discuss a TV’s sound with anything approaching enthusiasm, as the vast majority sound pretty awful by the standards of anything other than flat-panel TVs. The A9F is an exception that truly sounds good enough that you should wait on buying a soundbar or other outboard audio system until unboxed this TV and listened to it. Like the other Sony OLEDs before it, the A9F uses the actual display as a planar speaker, and its onboard amplifier produces plenty of volume including bass. The A9F has six actuators vibrating the glass, plus two standalone woofers. There are two inputs that allow you to use the TV as your center speaker in a surround setup. It functions as well or better than most dedicated center speakers in that role. The A9F supports most of the surround-sound formats with the exception of Dolby Atmos (a feature LG’s E8 offers). On the other hand, the A9F is the first OLED to support eARC, or enhanced Audio Return Channel, with its ability to transmit eight channels at 192kHz. Whether 192kHz sampling rates provides any genuine benefit is hotly debated in the audiophile community, despite hard and overwhelming science that says for playback, it doesn’t. But good on Sony for providing it. The A9F is an excellent TV—one of the best out there. You could buy it and never suffer a minute of buyer’s remorse; unless of course, you looked around at the significantly cheaper competition, which includes a couple of TVs from Sony. While there are some refinements, I personally didn’t find the A9F that much of an improvement over the A1E or A8F, at least not a $1,300 improvement. If you have deep pockets, you might appreciate the A9F’s superior audio performance and its slight uptick in video quality compared to those models. And then there’s the LG E8. Do you want the superior sound and huge app selection of the Sony, or the LG’s better picture processing, above-average sound, and superior user interface and remote control. If you find yourself needing a tie-breaker, look at the price tags? As of press time, LG E8 was going for about $1,200 less than the Sony A9F. The A9F series are great TVs. OLED provides excellent color and deep blacks, and no manufacturer does TV sound better than Sony. That said, it's not a vast improvement over its much-less-expensive predecessors, not to mention LG's E8-series OLEDs.